Healthy White Bean Dip Snack Recipe - Snacks are really good for health. This white bean dip snack recipe is so tasty and healthy that you will never forget to taste it again. Follow simple steps to cook Healthy White Bean Dip Snack at your home. Cut eggplant and bell pepper into medium-sized pieces, being sure to remove the seeds, and spread them out on a baking sheet that has been lined with parchment paper. Lightly coat the vegetables with olive oil, salt, and pepper. Roast the vegetables for 20-25 minutes, until the edges begin to char and the skin blisters. Add roasted vegetables to a food processor along with the beans, garlic, parsley, lemon juice, and seasonings. Pulse until the ingredients are roughly chopped. Then, with the machine running, slowly pour in the remaining 4 tablespoons of olive oil into the food processor and blend until the mixture is smooth. 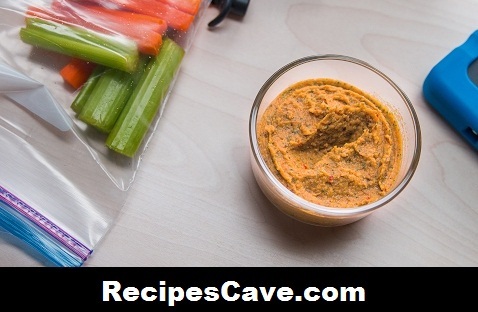 Transfer mixture to a bowl and serve with freshly cut vegetables, crackers, or pita bread. Alternatively, the mixture can be placed into individual serving-sized containers and stored in the refrigerator for up to 4 days. your Healthy White Bean Dip Snack Recipe is ready to taste.